Special enclosure and circuitry designs ensure that these portables meet ATEX requirements for intrinsic safety. Antistatic resin is used for the casing, battery and belt hook. Also, effective RF output is 1.2W, maintained within the upper limit set by ATEX directive. The Voting function (Intelligent Scanning) looks for and locks onto the best repeater station automatically in a multi-site system. for a preset period or if it is being shaken/swung violently as when someone is running. Scanning is a simple way to monitor multiple channels and the TK-2260EX/3260EX (16-channel capacity) offers both standard and priority scan modes. Another convenience is Talk Back, which allows immediate response to a call without having to manually search or change channels. Utilising Kenwood’s FleetSync® digital signalling protocol, the TK-2260EX/3260EX has PTT ID (ANI: automatic number identification) and Selective Calling capabilities for managed dispatch operations. The orange key can also be programmed for Emergency status to alert the dispatcher. The voice-inversion scrambler ensures basic communications security against casual eavesdropping. (FleetSync®, DTMF & 5-Tone) have call alert tones and LED indications. The user enjoys loud, clear, audio even in noisy environments. Kenwood has drawn on its longstanding audio heritage to optimize voice frequency components so that the audio output cuts through typical ambient noise. This enhancement and the companded noise reduction provide clarity and low distortion especially on narrow bandwidth systems. operation (18 hours with power save off)*. Specially designed for intrinsic safety, it can only be used with the TK-2260EX/3260EX. * Battery life is based on 5% transmit - 5% receive - 90% standby duty cycles. Equipped with the KNB-58LEX battery pack and KMC-46EX speaker microphone, these tough portables comply with the IP64 standard for dust and water intrusion as well as meeting or exceeding twelve stringent MIL-STD 810 C/D/E/F environmental standards. Note: If the KMC-46EX is not attached, the connector cover must be used for compliance with rain resistance and IP64 standard. NOTE: Please ensure the TK-2260EX/3260EX ATEX rating is acceptable for intended place of use. Kenwood’s TK-2260EX/3260EX portables are expressly designed to provide clear communications with intrinsic safety in potentially explosive duty environments such as oil refineries, chemical plants and grain silos. 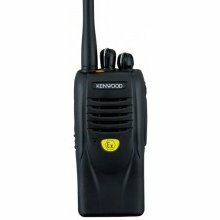 Kenwood radios are valued by professionals worldwide for their simple operation and reliable performance, and these new ATEX/IECEx-certified models boast such features as Lone Worker and Man-down Detection to further enhance employee safety.